"Pearl Pottery These Works, in Brook Street, were established by Ralph Salt (worked 1820-42, died 1846) and he and his successors, Richard Booth and Williams and Willet, manufactured painted earthenware figures. In 1860, the works passed into the hands of of William Taylor, who commenced making white granite and common coloured and painted ware. But this he discontinued, and confined himself to white granite-ware for the United States and Canadian markets, of both qualities - the bluish tinted for the provinces, and the poorer white for the city trade. 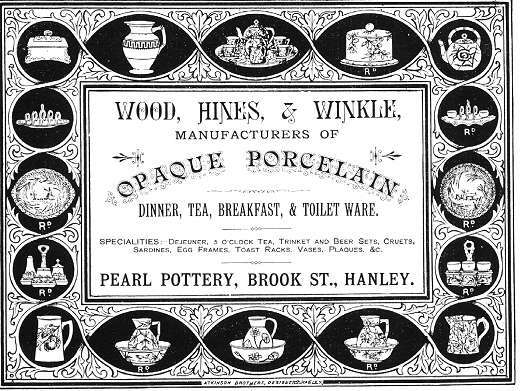 He was succeeded in 1881 by Wood, Hines and Winkle, who produced 'opaque porcelain' in all the usual services for dinner, tea, breakfast and toilet; a large number of specialties in dejeuner, five o'clock tea, trinket, and beer sets; vases, plaques, cruets, and other useful and ornamental articles up to 1885. 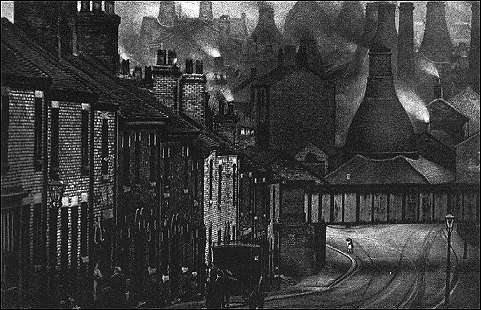 From 1885 to 1889, Messrs. Winkle & Wood worked the Pearl Pottery; and from about 1892, it was worked by Messrs. Wood and Bennett. A Wood, Hines and Winkle advertisement of 1884 is reproduced below." From 'Jewitt's Ceramic Art of Great Britain 1800-1900"
NOTE: The dates given by Jewitt are not be entirely accurate - the 1893 trade journal (see below) states that the Pearl Pottery Co took over in July 1892.